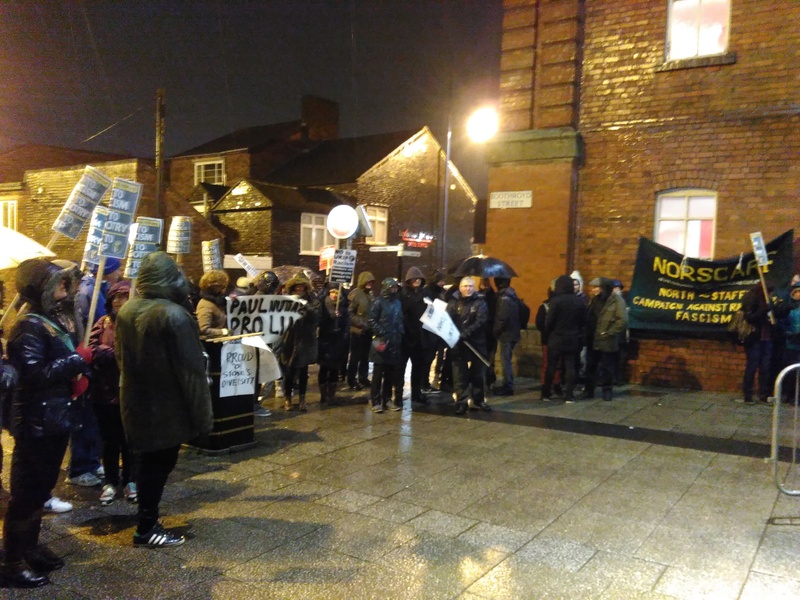 Around 80 anti-racists braved the cold and wet in Hanley last night to join a demonstration, called by NorSCARF, against a rally held by UKIP featuring Nigel Farage and Paul Nuttall at the Victoria Hall. Earlier that day while on a walk around the centre of Hanley both Farage and Nuttall were greeted and shown what Stoke residents think of their message as they were pelted with eggs. Despite the deteriorating conditions, protesters gathered to show that Stoke is a united city that will not be divided by those inside who look to use racist rhetoric to spread hate and division. The protest was drawn to a close following a rousing speech from NorSCARF officer Jason Hill, reminding those in attendance that it was this very same venue that 75 years ago this September, was packed out with local workers to launch the Lidice shall live campaign. They met to donate to help rebuild Lidice, a tiny village in the Czech Republic that was destroyed by the Nazis on 10 June 1942. Stoke has a proud history of taking a stand against those who look to use hate to divide our and other communities and we will continue to oppose UKIP as they look to do the same. Find below a photo slideshow from yesterday.